What changes make the 2018 Audi Q7 different? Newly standard equipment — including power door closers for the top-line model — and higher asking prices. These tweaks update a seven-passenger crossover SUV that was all-new for model-year 2017. Major revisions are unlikely before model-year 2020. Inside and out, the redesigned 2017 Q7 helped usher in a new design direction for the German automaker. And while its dimensions are roughly the same as those of the original 2006-2016 Q7, today’s model is about 500 pounds lighter thanks to aluminum-intensive construction. The payoff is better acceleration, handling, and fuel economy. Speaking of size and price, the Q7 occupies a middle ground among premium crossovers with three rows of seats. It’s slightly larger than the midsize-class Acura MDX or BMW X5 but smaller than the full-size Mercedes-Benz GLS. It’s more expensive than the Acura but less costly than its German rivals. Q7’s “not-too-big, not-too-small” approach is appealing for a fair number of luxury-crossover shoppers, but fewer than Audi would like. Despite sales that are up about 8 percent through the first quarter of 2017, the MDX, X5, and GLS remain more popular. Why should I purchase a 2018? Because it’s a highly refined crossover, its understated looks suit your style, you’re smitten with the sophisticated interior, and you don’t really need a third-row seat large enough to accommodate adults. Indeed, if you find the X5 too small and the GLS too big, this second-generation Q7 may be just right for you. For our part, we’re particularly intrigued by the turbo four-cylinder engine introduced during the 2017 model year. It isn’t as fast as the Q7’s other engine, a supercharged V-6. And it’s only a bit more fuel-efficient. But it shaves $6,500 from the base price, lowering the price of entry for a lot of Q7 intenders. This Audi and Volvo’s XC90 are the only three-row luxury crossovers available with a four-cylinder. 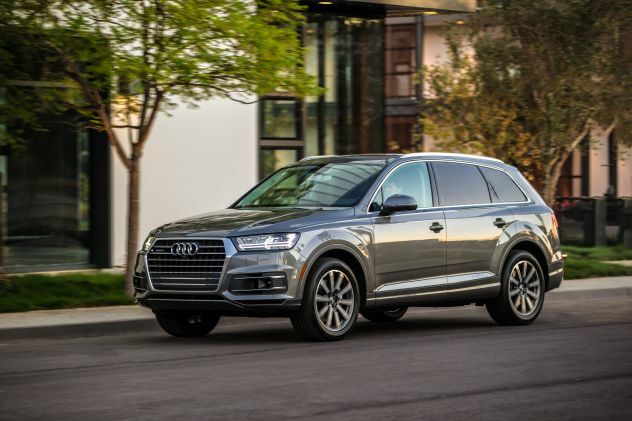 The 2018 Q7’s three-model lineup reprises base Premium and midrange Premium Plus grades with either the four- or six-cylinder engine, and top-line Prestige trim that’s V-6 only. All models come standard with Audi’s quattro all-wheel drive (AWD). Probably not. Except for a new color choice or two, it’ll likely be a rerun of the 2018 model. It’ll almost certainly cost more, though. And its looks and perhaps some features will have a shorter shelf life, given the expected model-year 2020 midcycle refresh that’ll freshened the styling and maybe update some equipment. If you’re interested in a pure-electric Audi crossover about the same size and general design as today’s Q7, wait until early calendar 2019. That’s the expected release window for the e-tron Quattro. Some reports label this all-wheel-drive battery-powered crossover the Q6. Said to deliver up to 300 miles per charge and with a starting price around $70,000, it would give Audi a direct competitor for the Tesla Model X all-electric premium midsize crossover. It’s unclear whether the “Q6” would have two or three seating rows, but calendar 2019 will welcome Audi’s new flagship crossover called the Q8. It’s shaping up as a sportier alternative to the Q7, with two luxurious seating rows and trendy coupe-style proportions. No. It’s a repeat of the 2017 look, which helped Audi introduce its current design language. Most apparent in the front end with its big hexagonal grille and raked headlights, the look is also evident on Audi’s A3 and A4 cars and the redesigned 2018 Q5 compact crossover. On the Q7, the reshaped roof and angular haunches brought a trimmer, more athletic look that complimented the quarter-ton reduction in curb weight. Still, there’s little visual excitement here, and some would deem the Q7 understated to a fault. Inside, things are as luxurious as you would expect from Audi. The dashboard and controls are pleasingly contemporary, and the brand’s available MultiMedia Interface (MMI) center-console infotainment-control system continues to improve for ease of use and overall responsiveness. The ultimate gee-whiz factor is the Prestige models’ standard Virtual Cockpit, which replaces a traditional instrument cluster with a single 12.3-inch programmable LCD display. Capable of showing strikingly clear navigation maps and other vehicle info, it’s a neat piece of gadgetry. But wrapping up so much data into a single display makes a system failure a frightening prospect. The first two seating rows are exceptionally accommodating and comfortable. The third row is somewhat problematic. Ingress and egress are very awkward, and there’s little more than toddler-size space. Another penalty of Q7’s “in-between” size: at 71.6 cubic feet, maximum cargo capacity is among the lowest of any three-row premium crossover. No. The 2018 Q7 reprises the ‘17’s four- and six-cylinder engine choices. The former is Audi-parent Volkswagen’s corporate turbocharged 2.0-liter unit, here with 252 horsepower and 273 pound-feet of torque. Models so equipped get the 2.0T designation. 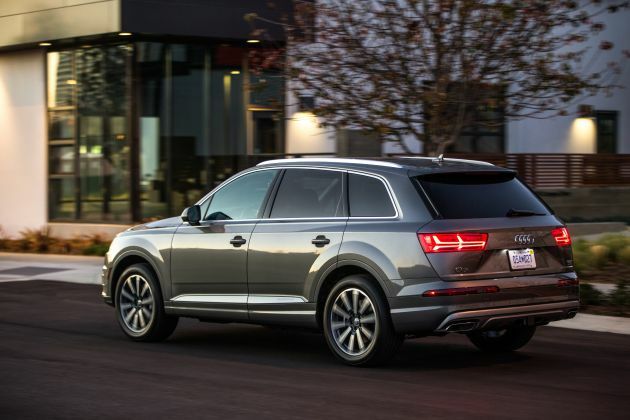 Despite having a supercharger as opposed to a turbocharger, Q7s with the available 3.0-liter V-6 are badged 3.0T and produce 333 horsepower and 325 pound-feet of torque. Power gets to all four wheels via quattro AWD and an 8-speed automatic transmission. An adaptive air suspension and handling-enhancing four-wheel steering are available on the Prestige model. We’ve not yet tested a Q7 2.0T but given our experience with this engine in other Audi vehicles, don’t assume it’ll feel underpowered, especially since a 2.0T will be more than 100 pounds lighter than a 3.0T. Even if it doesn’t feel quite as quick as Audi’s claimed 5.7 seconds 0-60 mph, the V-6 Q7 has plenty of power for any situation. And it can tow up to 7,700 pounds, more than a V-8 Mercedes GLS. The Q7 generally strikes a good balance between handling competence and ride comfort. It’s not as sharp through the twisties as an X5 or as composed over bumps as a GLS. But most buyers should find this Audi’s road manners more than satisfactory. For best ride composure, keep the available Audi Drive Select and air suspension systems in the default Auto setting. Comfort mode induces annoying secondary motions over bumps, while Sport makes the ride borderline harsh, with little corresponding improvement to handling. EPA ratings for the 2018 Q7 were not released in time for this report, but they shouldn’t change from the 2017’s numbers. Expect 2.0T models to again rate 20/25/22 mpg city/highway/combined. Surprisingly, this isn’t much better than the V-6’s 19/25/21-mpg rating. All ’18 Q7s will again require premium-grade 91-octane gasoline. Yes, though they fall into the “nice to have” bucket rather than things we would consider absolutely necessary. A keyless access and pushbutton ignition newly standard for all models. That convenience fits nicely with a level of standard equipment that includes – even on the “entry-level” Premium model — leather upholstery with 8-way power heated front seats, a panoramic moonroof, a power liftgate, front- and rear-obstacle detection, and xenon headlamps with LED daytime running lights. The 2018 Premium Plus model gains a Bose-brand audio system and continues to build on the Premium model with standard blind-spot and rear cross-traffic alert; hands-free operation for the power liftgate; and imbedded GPS navigation with support for Audi connect telematics, Apple CarPlay, and Google Android Auto. The Prestige version for ’18 adds power door closers to a comprehensive standard-equipment list that includes full LED headlights, four-zone automatic climate control, ventilated front seats, rear side-window sunshades, surround-view camera, head-up instrument display, and Virtual Cockpit. Kudos to Audi for making forward-collision alert and autonomous emergency braking standard on all Q7 models. Unfortunately, other driver-assistance features, such as radar-based adaptive cruise control; automatic high-beam headlights; and lane-departure warning/prevention are available only on the Premium Plus and Prestige models as part of the $2,400 Driver Assistance option package. Only Q7 models so equipped receive the Insurance Institute for Highway Safety’s second-highest award, called Top Safety Pick. The Q7 fell short of the institute’s ultimate Top Safety Pick+ rating because of headlight performance, a new metric added for the 2017 model year. They’ve increased by $400-$900, depending on model. That’s reasonable, considering that each trim level has a bit of additional equipment — plus there’s the expected year-over-year price inflation. Base prices listed here include Audi’s $975 destination fee. The 2018 Q7 2.0T Premium starts at $50,875, and the 2.0T Premium Plus at $54,875. The V-6 engine adds $6,500 to either model. At the top of the pecking order is the V-6-only Prestige, which lists for $66,375. Among key options, paint colors other than basic white or black cost $575-$3,900. Several wheel and tire packages that include rims of up to 21 inches in diameter cost $1,000-$1,800, depending on model. Other options available on all models include a Cold Weather Package with heated second-row seats and a sport steering wheel ($500); a Towing Package that increases the vehicle’s maximum capacity to as much as 7,700 pounds ($550); running boards ($1,200); torso-protecting rear-side airbags ($350); a factory-sourced wiring loom that can accept a dealer-installed dual-screen rear-seat entertainment system ($150); and a black cloth headliner (no charge). At $3,000, the Premium’s MMI Navigation Plus Package would again include in-dash GPS mapping, Audi connect, and Apple CarPlay/Android Auto. Many of the Pestige’s standard features are again available on the Premium Plus. The $2,000 Vision Package nets full LED headlights, Virtual Cockpit, and surround-view camera. The $1,050 Ventilation Package includes ventilated front seats and sunshades for the rear windows and tailgate. For $1,600, you can upgrade to the Warm Weather Package, which includes all the Ventilation Package’s items plus four-zone automatic climate control. Prestige models offer several exclusive options and packages. The $5,500 Luxury Package includes massaging front seats with 18-way power adjustment, additional leather trim in the cabin, Valcona-brand leather, and an Alcantara faux-suede headliner. The $1,500 Titanium-Black Optic Package includes unique exterior trim and 21-inch wheels on summer-only performance tires. The $4,000 Adaptive Chassis Package adds the previously mentioned air suspension and four-wheel steering. Prestige-exclusive standalone options include a 23-speaker Bang & Olufsen audio system ($5,000) and a night-vision camera ($2,500). At $60,300, our pick is the Q7 Premium Plus 2.0T with the Driver Assistance, Cold Weather, and Warm Weather packages, along with extra-cost paint and rear-side airbags. We wish Audi would separate the Virtual Cockpit from the Vision Package so you could take advantage of the otherwise worthwhile LED headlights and surround camera. Release date for the 2018 Audi Q7 is May 2017. We’d like to see Audi include a full suite of driver-assistance features as standard on all models. Further, the company should make the gimmicky Virtual Cockpit a standalone option instead of as standard (as on the Prestige) or bundling it with other amenities like the surround camera and LED headlights. It’s also a shame that the outstanding Bang & Olufsen audio system isn’t available on the Premium Plus as well.